When it comes to complementing hydronic systems, few companies offer as many options as Caleffi. Whether you’re looking for an easy way to zone a system or a solution to streamline installation, the Caleffi catalog has something for you. Today, we’re going to be taking a look at one of Caleffi’s most versatile products: the SEP4 4-in-1 hydraulic separator. As the name suggests, this product provides four distinct types of separation for hydronic systems. This cuts down on the amount of accessories and parts that you need to buy and install, saving you time and money on hydronic installations. Each SEP4 unit includes an insulated PEX shell that prevents both heat loss and the formation of condensation on the separator. These devices are available with sweat, NPT, or press connections with a size of 1″, 1.25″, 1.5″, or 2″. We’ll start with the SEP4’s primary function: hydraulic separation. The SEP4 can create and maintain two hydraulically separated circuits. This is accomplished through a low-pressure loss zone that in generated within the SEP4 unit. Hydraulically separated circuits exist completely independent from one another meaning that the flow rates can be adjusted individually without affecting the other circuit. This allows multiple circulators to operate at different rates as your customer’s specific application demands. The SEP4 has a two-step, two device process to ensure that all air is expunged from your client’s hydronic system. At each cross section in the SEP4 hydraulic separator, Caleffi installed an HDPE coalescing element. This element agitates the liquid that flows through it, facilitating provides a surface on which the air microbubbles can gather before joining, floating upwards, and being expelled. The expulsion happens through the air elimination device: the automatic air vent. Located at the top of the SEP4 hydraulic separator, this vent gathers the coalesced air bubbles and sends them safely out of the system. The high-density polyethylene coalescing elements also play a vital role in the removal of dirt from the system. These devices serve to disrupt dirt particles, removing them as the liquid flows through. This process is effective on microparticles of dirt as small as 5 microns (0.005 mm!). Once dirt particles are separated, they can be removed easily through a convenient drain valve at the base of the SEP4. This drain valve can even be utilized during operation. When iron or steel corrodes, it can create magnetite and other impurities. These metal particles can end up spelling major trouble for heat exchangers and circulators. 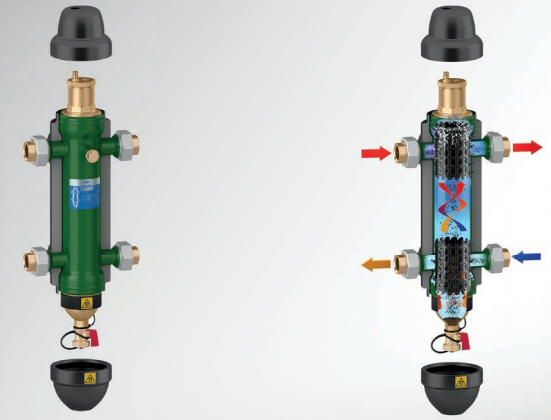 It’s fairly common for air and dirt separators to have some kind of gimmick to aid in the removal of ferrous impurities in the system. It is not common for these devices to have a neodymium rare-earth magnet as part of the standard package. This magnet empowers the SEP4 to capture two-and-a-half times the impurities of standard separator. Any particulates captured in this manner can be flushed out of the system through the same drain used for dirt microparticles. The SEP4 4-in-1 hydraulic separator is an excellent example of how Caleffi can help you complete a system. With the SEP4, you get two independent hydraulic circuits both of which are covered by three levels of protection. With a SEP4 in the system, your annual maintenance visits will be pretty boring.